A number of years ago, after years of shooting exclusively digital, I felt like I needed to slow down as a photographer. I wanted to trade, at least occasionally, the ease, precision and instant gratification of digital photography for something that required me to spend more time with the subject – to really immerse myself in the meaning and composition of each frame. I was missing the mystery of photography, the magic that happens in the box. I wanted to put some of the guesswork and intuition back into my image making. This led me to the pinhole camera. 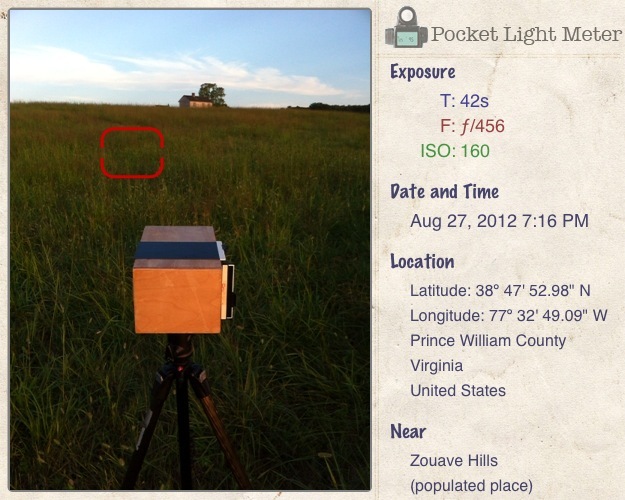 My iPhone Pocket Light Meter records the position of the pinhole camera, exposure and GPS information for the image below at Manassas, Va in 2012. 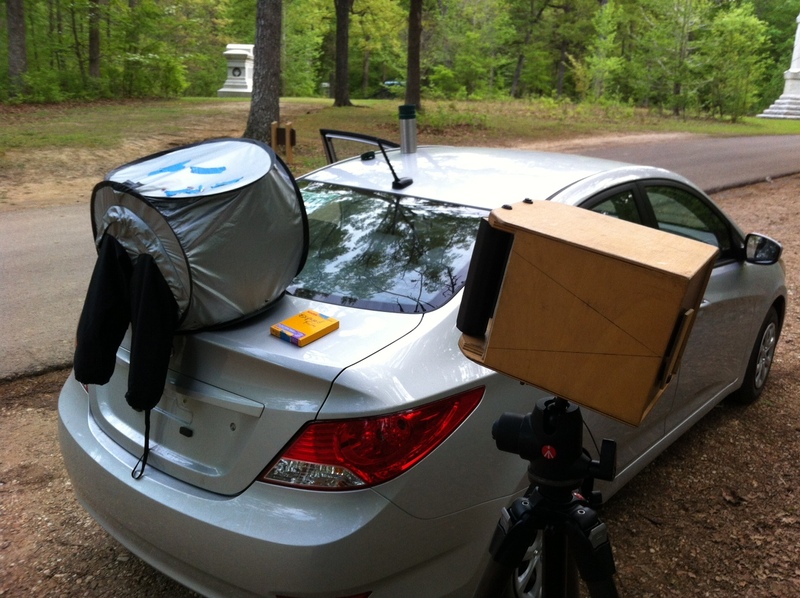 To shoot with a pinhole camera is, quite literally, to get back to basics. I soon realized these simple cameras had an uncanny and remarkable capability of depicting and rendering landscapes. The cameras somehow looked deeper into the subjects and I actually found myself experiencing these landscapes and the photographic process in a deeper way. For instance, after working with the cameras over time the handicap of having no viewfinder to compose with actually became a blessing. I began to experience the entire landscape, walking into the compositions and then carefully positioning the camera to make the photographs; the process unhurried and deliberate. Late day light is captured in this 2 minute exposure of the Henry House on the Battlefield at Manassas, Virginia in 2012. This point of view, showing just the top of the Henry House, is intended and gives the Confederate perspective in the attack made here in August 1862. The pinhole camera has no “lens” per se. The tiny fixed aperture creates a soft infinite focal plane – a canvas where details are obscured allowing the “feeling”of the landscape to come through. The pinhole seems to capture the very essence of the subject. This I believe is due to the rudimentary mechanics of the pinhole camera. The tiny pinhole of light simply enters the camera and is captured directly onto large format sheet film creating the image. This minuscule amount of light entering the camera requires long exposure times; the wind blows, rivers flow, the clouds move, the earth rotates…taken over time each image is sort of a living record of a moment in time. Where digital photography is like good non-fiction, sharp and detailed, pinhole photography somehow has the profound emotional honesty, the subjective truth of a great novel. Each image carries with it a story, or many different stories. In addition to this I’ve found that the soft quality of the pinhole photograph itself encourages the viewer to linger on the images. While viewing the image the observer inadvertently fills out the blurred information with his or her own memories and experiences unconsciously becoming a participant in each image they encounter. These discoveries with the pinhole camera happen to coincided with a subject that had been an interest of mine since childhood, the American Civil War. In 2009 as the 150th anniversary of the war approached I began to read exclusively on this subject and inadvertently tumbled down the “rabbit hole” of Civil War History. My only desire after reading a small library’s worth of this material was to visit the wars’ battlefields. And, I would bring the pinhole camera. The photographic journey began in July 2011 on the Battlefield at Manassas, Virginia, where, after spending a couple of days photographing the battlefield, I struck up a conversation with some living historians. 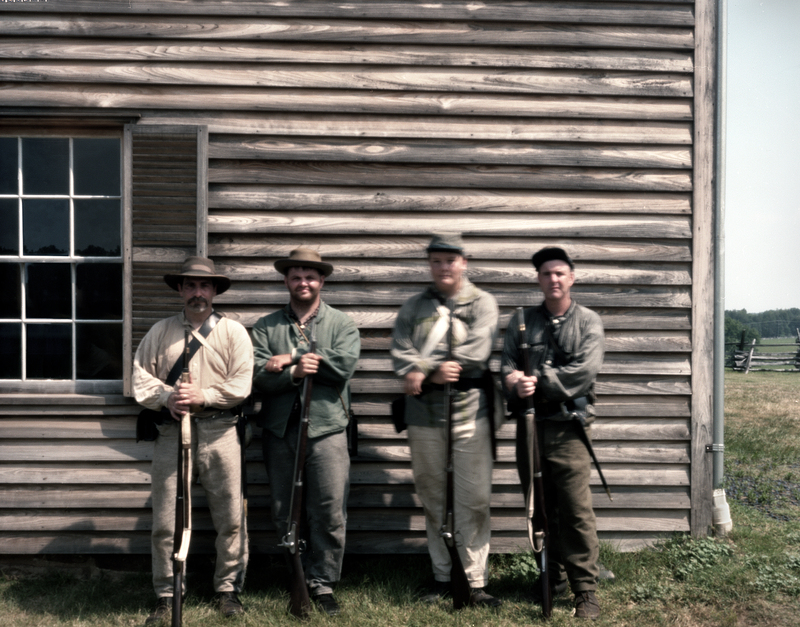 The small group of confederate reenactors were participating in battlefield programs for the National Parks Service. I decided to take a photo of these gentlemen and upon my return home, looking over the film, I realized that photo of these reenactors did something that I hadn’t noticed before. When working with the pinhole camera over the years I tended to avoid portraits. I was never happy with the way the camera rendered people. But the soldier-actors because they were in uniform completely changed my perspective on this. 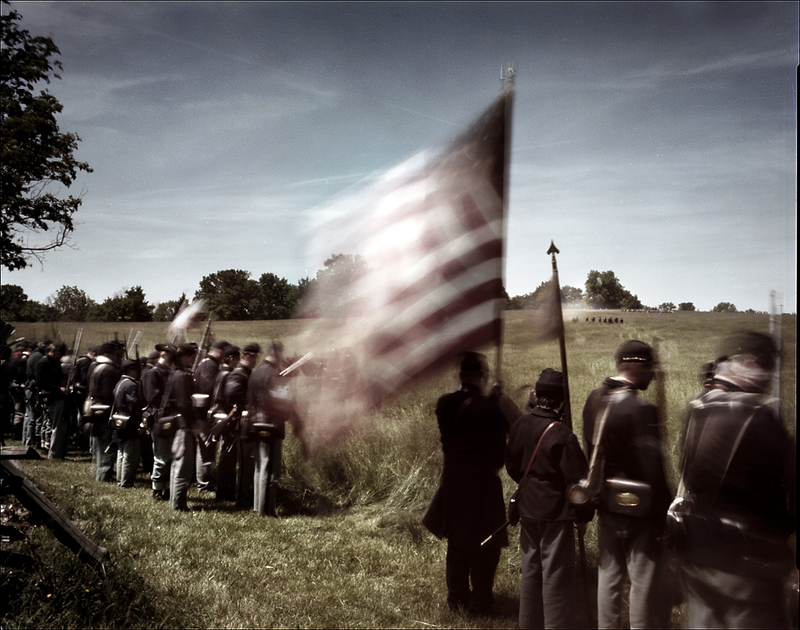 Their uniforms brought a cohesion to the image and the slightly blurred, soft focus quality of the pinhole camera made the reenactors seem anonymous in a sense, rendering them as “every soldier” – This image also introduced period characters into the 19th century landscape I was marveling at… the Battlefield at Manassas seemed to come alive. 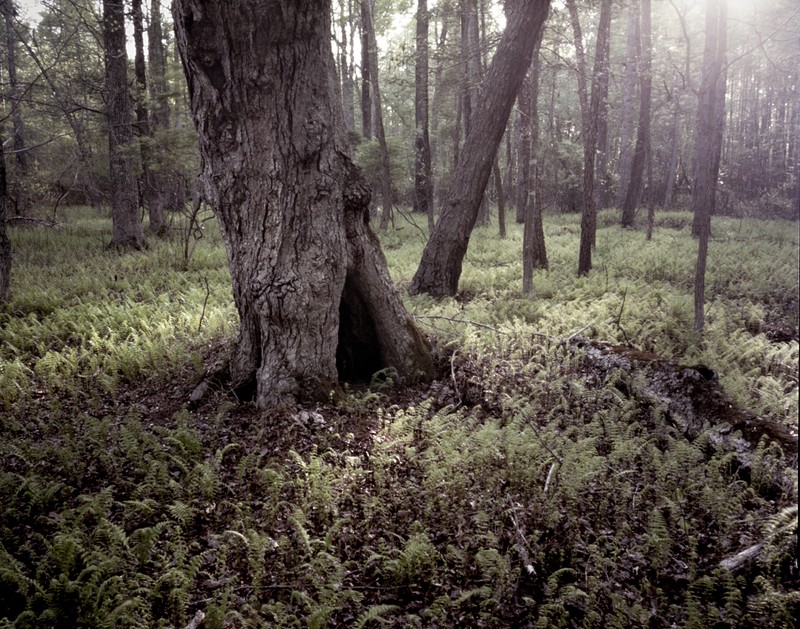 The idea of simply photographing Civil War battlefields for this project evolved at this point. For the next trip in the project timeline, to the Battlefield at Shiloh, Tennessee I attended the 150th anniversary battle reenactment in neighboring Michie, TN in April 2012. Standing on the sidelines with the pinhole cameras watching and photographing thousands of reenactors as they participated in this event was a revelation. The idea of “seeing the war from the soldiers’ perspective” began to fascinate me. I soon realized that to gain this perspective I would need to become a reenactor myself. I spent the following days exploring and photographing the actual Battlefield at Shiloh with this perspective in mind. I would photograph the battlefields from the 19th century soldiers’ point of view, directing the camera toward the same landscapes these soldiers took in as these battles raged 150 years ago. These battlefield landscapes would be placed alongside the reenactment images to create a visual narrative. Following the timeline of the “War Between the States” the images will culminate in a grand poetic commemoration of the Civil War Sesquicentennial. My first two pinhole cameras were made by a company called Leonardo and can be found online at a site called Pinhole Resource. However, after using these two cameras for a while I enlisted the help of my brother, Henry Falco, a recording engineer and woodworking artist, to help expand my pinhole camera collection. 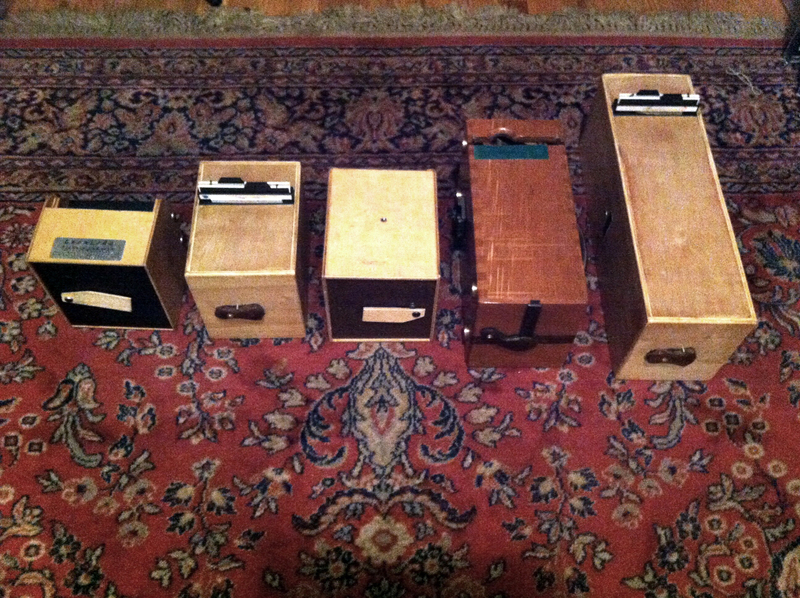 Henry has built me a whole series of pinhole cameras since. The cameras accept traditional 4×5 inch and 8×10 inch film holders which can be loaded with sheet film, in the field, with a portable darkroom. To help with the handicap of having no viewfinder I designed the cameras to approximate the focal lengths of the 35mm camera lenses I’ve used in my professional career as a photojournalist and commercial photographer over the last twenty years. Working with the pinhole cameras can be challenging. As stated, there is no viewfinder so composing takes careful consideration. There is a limited amount of film and film holders I can carry. This means typically taking only one frame of film per subject. To attain a “sharp” image the camera always needs to be on a tripod. There is no photoshopping or retouching in the Project images only basic toning/color correction and traditional darkroom techniques. Working with these cameras at the reenactments with moving subjects can be especially difficult. Moving back and forth over a landscape as the “battle” takes place I find that my focus on the subjects becomes very intense. I’m looking for a moment, a pause….I use my instincts and pray. What the material in which the pinhole is created, and what’s the diameter of the pinhole? The actual pinholes are made of thin sheets of steel, diameters of the pinholes, their apertures, vary according to the focal length of the camera. Great photos. What emulsions are you using? Thanks. I was using Polaroid 4 X 5, but I guess you know about that medium’s unhappy demise. Any thoughts on Pinhole digital? Mark, sorry about the delay in response….i guess when they can manufacture a CCD thats 4×5 inches and doesn’t cost 1 million dollars, yes, pinhole digital, but until then…. wow, this is really fantastic! thanks for sharing all your work on your website. Fantastic work! Early days of photography brought back to life. Question: in the Rappahannock River shot, isd that a 1952 Mercury on the bank in front of the cannon? Bill, i try and position myself and the camera so nothing from the 21st century is in these photos, but that can sometimes be hard…..
linda, thanks for looking at the blog. 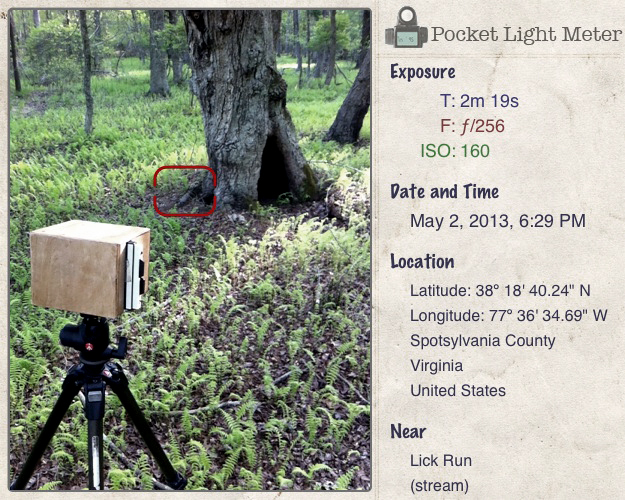 The pinhole camera actually predates the Civil War. By the time the 1860s rolled around photographers were using “much better” technology. 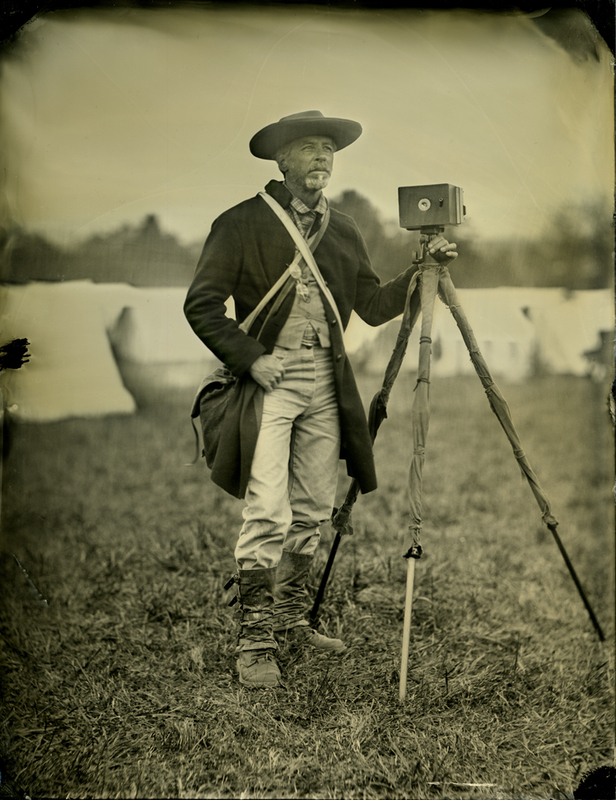 Matthew Brady, famous Civil War photographer, used the ambrotype or wet plate, photography. His camera, and other cameras used during the Civil War generally could be focused and had lenses. 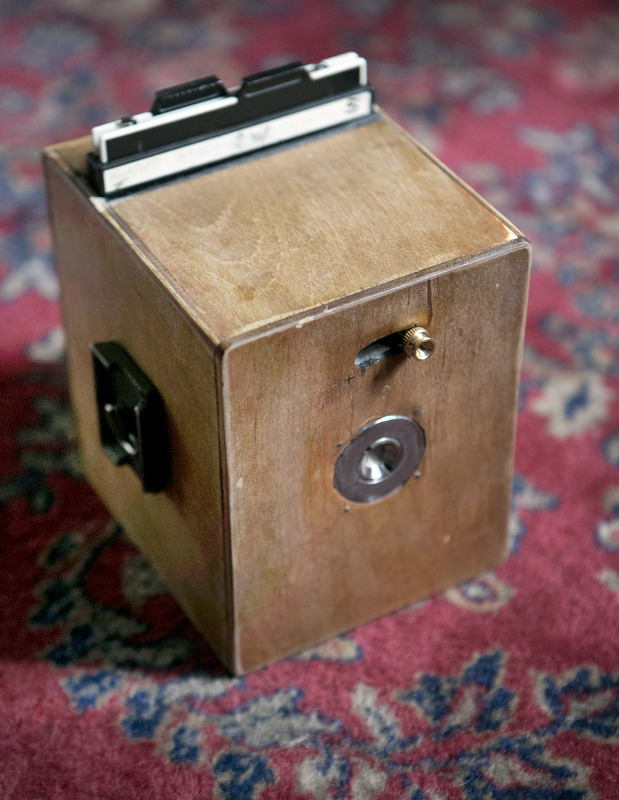 Pinhole camera takes a photo without a lens, there is no focusing. That being said, i know of no pinhole camera photos from the civil war. Great shots! What is your average exposure time? exposures vary quite a bit depending on the light and film speed. Average daylight exposure, on 160 speed film, in full sun, 4 – 12 seconds. Exposures on overcast days run 30 seconds to 6 minutes, again depending on the light, subject reflectance and other factors. Thanks honey, just got back from Gettysburg, exhausted, so nice seeing you a few weks ago! Your project has a way of giving presence to that vision that General Chamberlain so eloquently spoke of. Thank you again and I hope to see you on the fields of Gettysburg or elsewhere. alan, Hello. It was a pleasure to meet you as well. 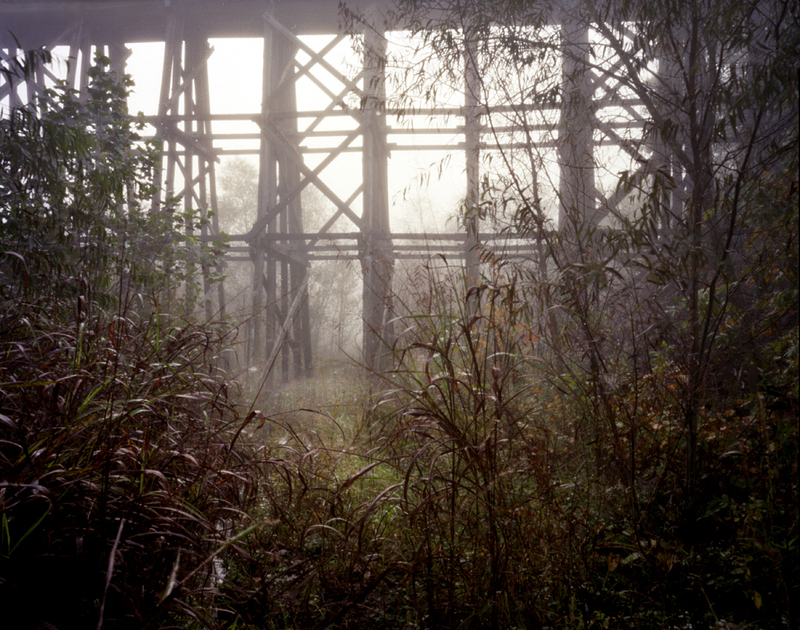 Thanks for the comments on the pinhole work, it is a labor of love. Your comparison with the Chamberlain quote, to my work, is touching and what im striving for , in a sense, with the project. Hope to see you out there again. 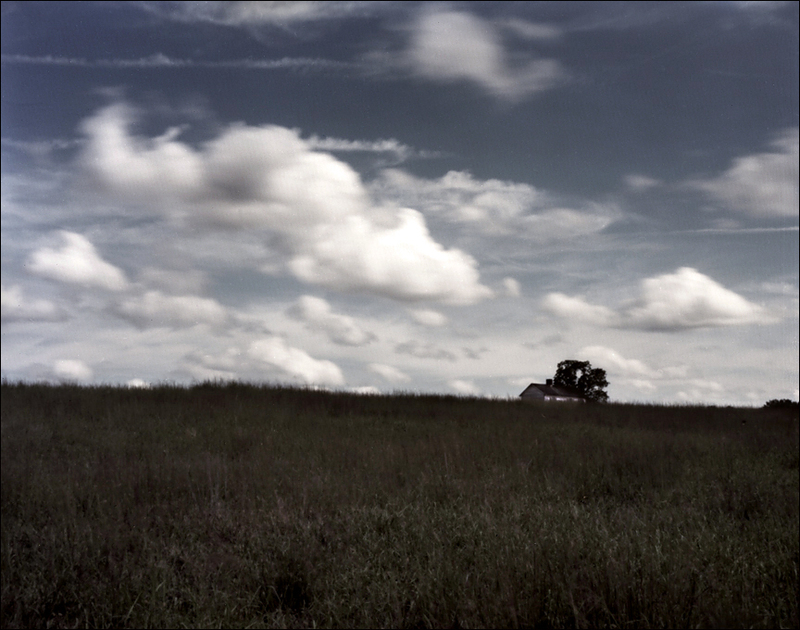 Ill be posting the entire Gettysburg work in a couple weeks, please check back. 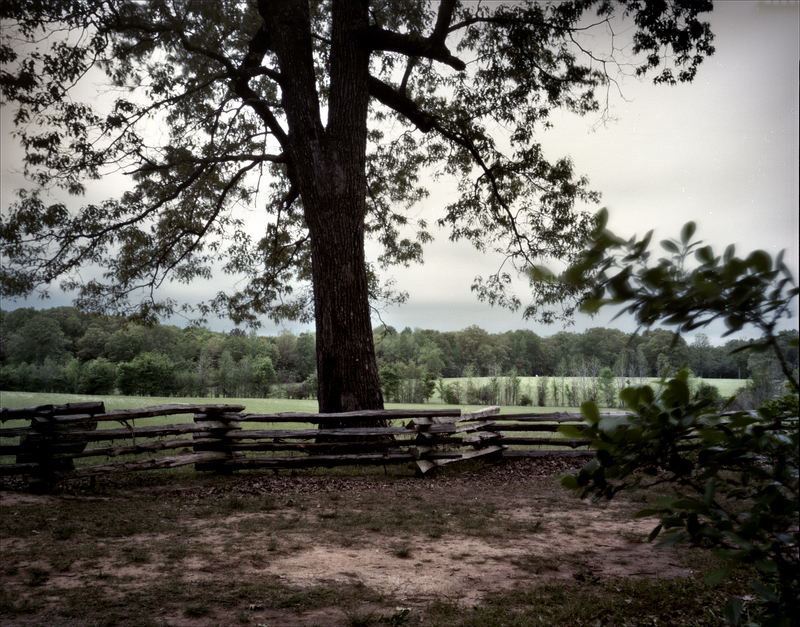 I love your work, especially the Civil War pinhole series. I have been playing around with pinholes on my digital camera and have not quite gotten the hang of it. I thought it was just something that wouldn’t ever amount to a decent photo. I’m very excited to start trying my hand at some glass plates but your work has really made me want to investigate pinhole more. Do you ever offer classes or know of any books that could help me get started? Technical question, how do you know how long to expose each individual photo? Hello, thanks for visiting the blog. Each pinhole camera has its own fixed aperture setting so the exposure of an image would vary between cameras. In the field I use a light meter, an iPhone app, that tells me what the exposure should be and then i typically double the exposure to compensate for reciprocity failure. Im using Kodak Porta 4×5 film at 160 and 400 iso. Might sound complicated but I actually don’t even use the light meter anymore. Depending on the camera, in full sun, on iso 160 film, the exposure range from 2-10 seconds. The only variable you can play with when working with the pinhole camera is time….the pinhole apertures are so small that the difference between, say 10 seconds and a 30 second exposure, is actually not that much, the negative is only slightly denser and totally workable. I frequently extend the exposure times beyond the meter reading to enhance the blurred effects from wind etc.